It's February and love is in the air, heart-shaped boxes full of delicious chocolate have flooded store shelves and teddy bears are piled to the ceilings. My idea of the perfect Valentine's Day gift happens to be none of the above, don't get me wrong I love chocolate and all things cute, but the sure way to my heart is through anything beauty-related! Avon always releases the cutest cosmetics, skin care, jewelry and accessories for every special occasion, whether you're just treating yourself, celebrating Valentine's day or even Galentine's day with your besties, Avon's got you covered. Avon always amazes me with their creativity, I'm always left in awe with the packaging, especially with their lipsticks. This Valentine's day is no exception, and the item's I'm going to show you are a great example of the perfect gift for the makeup loving gal in your life. The first step to this perfect little gift is the gift box, I don't know about you, but I tend to keep gift boxes and find other ways to re-purpose them. Avon offer's a cute gift box with each purchase from the "Love Is In The Air" pamphlet, making your Valentine's Day shopping that much easier. This little collection of love includes Lip Gloss's, Lips Stick's, Bath Bomb's, Candle's and even goodies for the kid's. Enough about the adorable box this gift set came in, let's chat about the goods inside. The first item that caught my attention was the Gimme Lip! Gloss in "Sweet". The container is in the shape of lips, full of a clear liquid and large heart glitter and oh so aesthetically pleasing. The inside is divided into two sections, one side is a baby pink and the other is a true red. Avon also offer's another shade which includes a plumb and a bright pink. Avon | Gloss Duo in "Sweet"
While were talking about lips, let's move onto the next two items in this gift box, Lipstick's! Avon sent me two different shades of their Queen Of Heart's lipstick, "Red Hot" and "Berry Romantic", the shade names are adorable. These lipstick's come in a paper-like yet very sturdy packaging, it's quite neat. I was pleasantly surprised to see that the lipstick itself is in the shape of a heart, it can't get much cuter than that! Avon | Queen Of Heart's Lipstick in "Red Hot" & "Berry Romantic"
Below I have added some swatches of each lip shade mentioned in today's blog, I am always left very impressed with Avon's lip products. "Berry Romantic" and "Red Hot" are very rich in colour, the application is beautiful and the pay-off is exceptional. 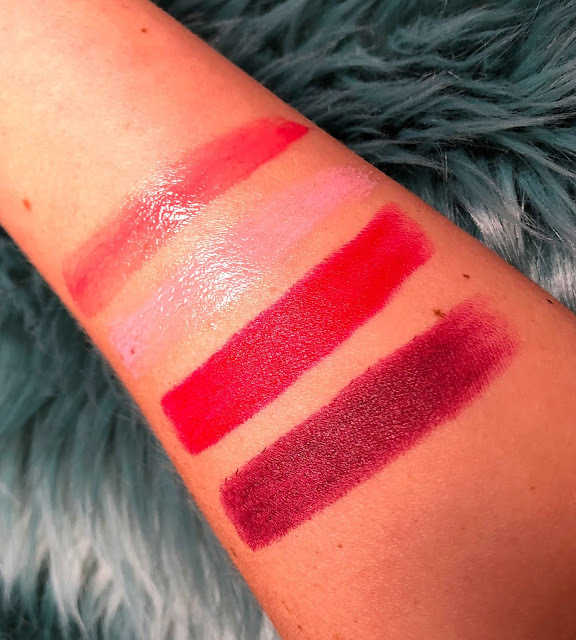 The lip glosses are perfect if you're looking for a light wash of colour on bare lips, you could even use them as toppers on the heart shaped lippies for a flirty glossed look. The last item in my Avon gift box is this adorable Conversation Bath Bomb, it has a floral yet sweet smell. Whether treating yourself, or gifting, bath bombs always make a great gift. "Be Mine' left my skin feeling fresh, soft and smelling like a sweet flower. I was happy to see that there was no staining or particles left in my tub once I had drained the water. Avon also offers some bomb's for the little one's in your life such as, a mermaid tail and a unicorn bath bomb. Have a peak at Avon's "Love Is In The Air" Brochure and check out the cute Valentine's Day options they have to offer! To conclude today's blog, I would also like to add how extremely affordable all of these gift's are, each one ranges from $7.99 to $9.99. Yes they're affordable, but the quality of these products are also wonderful. The lipstick's are gorgeous, long-lasting and creamy, the glosses are smooth and not sticky at all and the bath bomb makes the perfect addition to your night of relaxation. Avon also support's some great causes such as the Breast Cancer Crusade, Pink Hope (Fight against breast cancer) and Purple Peace (Speaking out against domestic violence), It warm's my heart when business's not only put out great product's but also contribute to much-needed charities. Thank you for reading and I hope you all have a wonderful Valentine's Day!